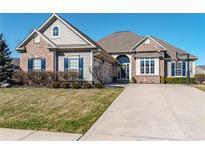 Below you can view all the homes for sale in the Chapel Woods subdivision located in Noblesville Indiana. Listings in Chapel Woods are updated daily from data we receive from the Indianapolis multiple listing service. To learn more about any of these homes or to receive custom notifications when a new property is listed for sale in Chapel Woods, give us a call at 317-910-4605. Mud room, 3 car garage. Irrigation system. MLS#21626411. Berkshire Hathaway Home. Owner's Suite with tray ceiling and walk-in closet; bath with double sinks and large shower. This home is just stunning! MLS#21628373. Keller Williams Indy Metro NE. Warranty included and all appliances stay, community pool & playground! Don't miss out! MLS#21628274. RE/MAX Ability Plus. Unfinished basement with bath rough-in. Backyard with deck. MLS#21623446. Keller Williams Indpls Metro N.
Chapel Woods offers an attractive common area with POOL and Playground! Close to I-69 & SR 37. MLS#21623312. RE/MAX Ability Plus. All of this on a great cul-de-sac lot. MLS#21619920. CENTURY 21 Scheetz.